This article covers the basics of how a blog works in WordPress. Posts, which contain the blog content topics. 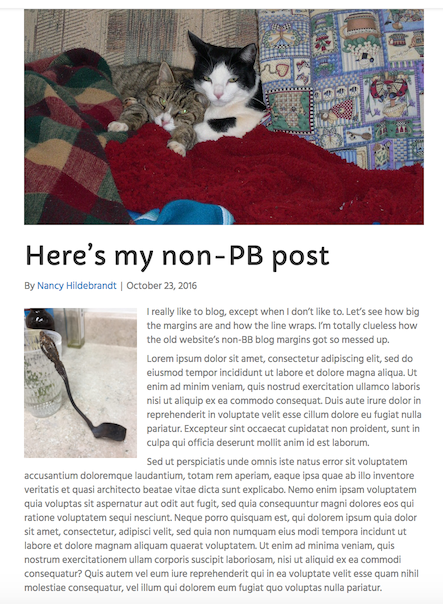 Each Post produces a separate blog post. Index (Posts page) and archive pages, which WordPress generates to organize and display lists of Posts. Note: In the WordPress admin panel, Posts are located in a different section from Pages, so we'll refer to those formal categories by using a capital P.
WordPress organizes Posts in reverse chronological order. You can assign categories and tags to Posts. There are optional WordPress sidebar widgets that display Post metadata (date, categories, tags, and so on) to enable users to filter the Posts in various ways. Everything is customizable, but this is how WordPress handles Posts with a fresh installation. This means that your Posts page is generated by WordPress on your home page. It doesn't exist as any post or page you can open for editing. The index is a list of your most recent Posts in reverse chronological order, either excerpted or in full form, with links to the individual posts. 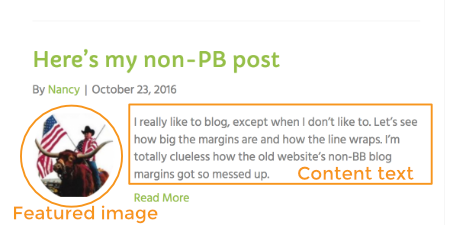 You might or might not see a sidebar with widgets related to Posts, such as categories and tags for the blog, or previous posts organized by date. Whether the sidebar appears by default depends on your theme. You can change the default index page to appear on a static page other than your home page. Here's a screenshot of a prototypical index page. Each Post is listed with its title, author, date, a content excerpt, and a featured image. The sidebar on the right contains common Post metadata. Here's an example of an archive page that's displaying the Posts for a particular month. 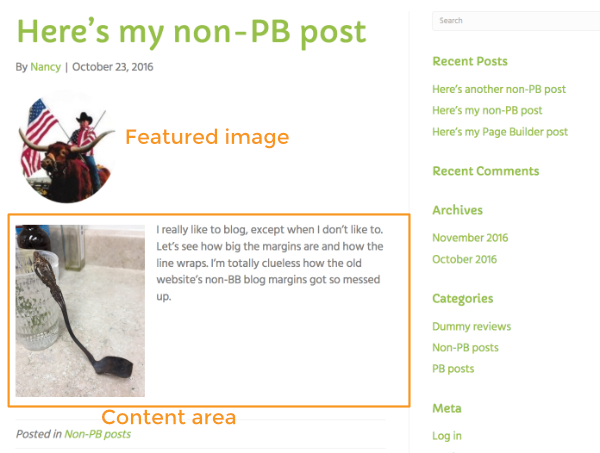 Each blog post has its own single Post page with the title, the author and date (unless hidden), the featured image if there is one, and the full content of the post. For example, the following screenshot shows the Post featured image at the top, the Author and Date under the title, and the Post content area, which includes the part of the post written inside the WordPress text editor, which includes a left-aligned image in this case. 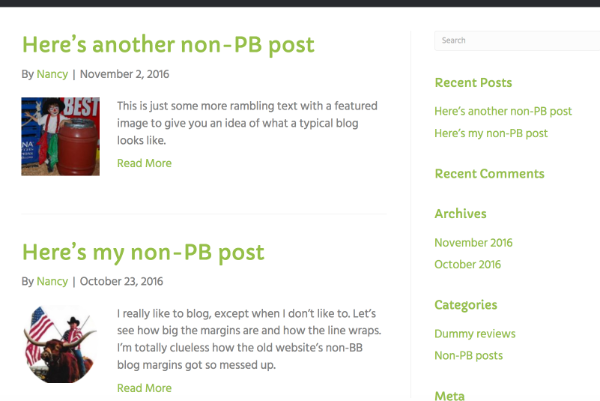 A single post may have other features, such as Previous and Next buttons to navigate the Posts and a sidebar with various WordPress Post widgets. Note: In the Beaver Builder Theme, you configure the sidebars, metadata, and other aspects of how these Post and archive pages are displayed in Appearance > Customize > Content. That embedded image does not show up on the archive page, as shown in the following screenshot. Note: Content from shortcodes inserted into posts that weren't edited with Beaver Builder will also not appear in index and archive summaries.